Cockhill Celtic eased into the second round of the FAI Intermediate Cup when they saw off Fanad United by 4-1 on Sunday. Meanwhile in the Ulster Senior League, Letterkenny Rovers got the better of Swilly Rovers at Leckview Park. Next weekend, the USL will play host to the annual FAI Interprovincials tournament with games taking place here in Donegal on Friday, Saturday and Sunday. 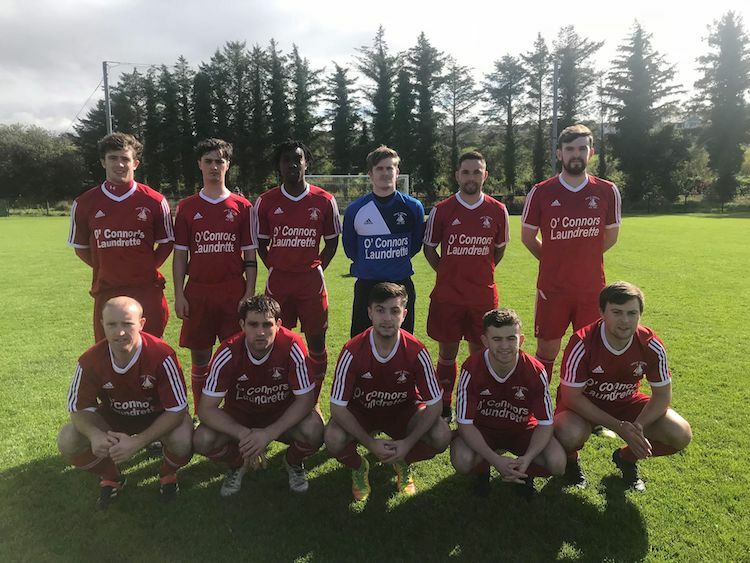 A below par Letterkenny Rovers - who played the entire second half with ten men - dug deep to defeat Swilly Rovers 3-1 in a lively encounter at a windy Leckview Park on Sunday. Indeed it was a magical brace from BJ Banda which eventually proved to be the difference between the two sides when referee John Coll blew the full time whistle with Banda making it five goals in the last three games, with two of those as substitute appearances. This game had everything and it will be the Ramelton men who will come away from the encounter wondering how they did not manage to secure at least a draw. Credit must be given to the home side who worked hard to achieve a second successive league victory and extend their winning run in the league and cup to three games. Swilly had the first chance and Chris Malseed had to be alert to clear after Kennedy Boache-Ansah did well on the right hand side and fired in a teasing cross. It was the home side who went ahead just five minutes into the game when Luke Nelis converted from close range following a surging run after a pinpoint cross from Kevin McGrath while McGrath shot over when well placed just two minutes later. That should have settled things down for Eamon McConigley’s men - but they went on to have a disjointed opening period. Swilly had two gilt-edged chances when the industrious Tony McNamee somehow failed to convert when sent through on goal by David Fisher on 15 minutes while a mixup in defence on 32 minutes saw Boache-Ansah nip in but the retreating Conor Tourish was able to clear off the line. The game though was turned on its head just before half time when Letterkenny were reduced to ten men when defender Christopher Flanagan was sent off for what referee John Coll deemed to be a dangerous tackle on Swilly’s Sean Crossan who had to be substituted at half-time. That meant it was going to be an uphill battle for the Leckview men in the second half and the Lennonsiders began where they left off with new signing Aaron Rogan - on his return to the club - having a tame free kick well saved by Kelly. Swilly had a cracking chance to level on 55 when Kelly failed to clear his lines and McNamee somehow shot wide when it seemed easier to score. Rogan came close with a header on 69 minutes before Swilly got a deserved equaliser on 71 minutes. A quick breakaway led to an intricate move down the right hand side which saw a cross converted by Boache-Ansah despite the best efforts of McGrath to clear. That instilled some belief that they could go and win the match but credit is due to the home side who regrouped and despite the numerical disadvantage dominated the final 15 minutes with a Bonner free kick well stopped by Muldoon before Letterkenny got ahead on 82 minutes. The goal was well worked with a long diagonal pass from Tourish found the lively Odhran McMacken and his cross was met by Banda who hit a left foot instinctive rocket which gave Muldoon no chance. Banda doubled the lead on 87 minutes when firing home a composed finish after a delightful move which saw Bonner as the catalyst. Letterkenny were delighted to get the three points given the circumstances but manager Eamon McConigley will know there is some challenging work to do if his side are to be considered title challengers. Swilly gaffer Tony McNamee Senior will be wondering how his side did not get something from the game but will be encouraged by his side's display going forward into the season. Swilly Rovers: Gareth Muldoon, Duncan Patetrson, Sean Crossan, Kieran Toland, Dylan Hegarty, James McCahill, David Fisher, Aaron Rogan, Kennedy Boache-Ansah, Tony McNamee, Marty McDaid. Subs: Matthew McLaughlin for Crossan (45), Brad Patterson for McCahill (73), Ciaran McHugh for McDaid (83).